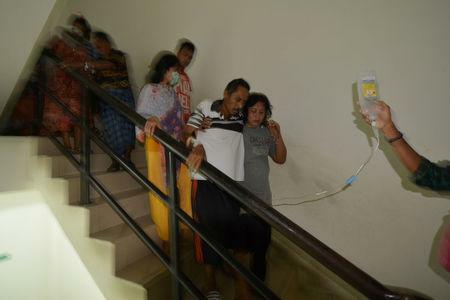 Patients are led down the stairs at Anutapura Hospital following an earthquake in Palu, Central Sulawesi, Indonesia, May 29, 2017 in this photo taken by Antara Foto. 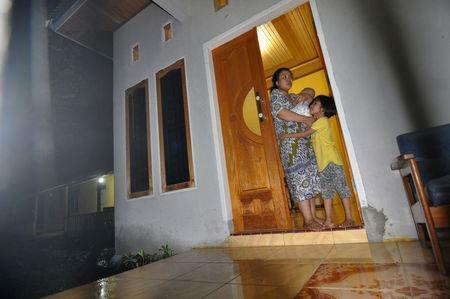 Antara Foto/Basri Marzuki/via REUTERS ATTENTION EDITORS - THIS IMAGE HAS BEEN SUPPLIED BY A THIRD PARTY. IT IS DISTRIBUTED, EXACTLY AS RECEIVED BY REUTERS, AS A SERVICE TO CLIENTS. FOR EDITORIAL USE ONLY. NOT FOR SALE FOR MARKETING OR ADVERTISING CAMPAIGNS. MANDATORY CREDIT. INDONESIA OUT. NO COMMERCIAL OR EDITORIAL SALES IN INDONESIA. JAKARTA (Reuters) - A powerful earthquake struck an area southeast of the Indonesian city of Palu and nearest to the town of Poso on the island of Sulawesi on Monday, prompting people to flee from their homes though there was no tsunami warning issued, officials said. Sutopo Nugroho, a spokesman for Indonesia's disaster mitigation agency, said in a statement the quake lasted around 20 seconds and caused panic and people to rush out of their houses. Many have stayed outside because of an aftershock. Darma Lebang, an official at Indonesia's search and rescue agency, said there were no reports of casualties but according to security personnel based in Poso some older buildings in the town had been damaged. Earlier, the Indonesian Agency for Meteorology, Climatology and Geophysics said there was no threat of a tsunami following the quake. The U.S. Geological Survey had initially put the magnitude of the quake at 6.9, though this was later reduced to 6.6 with a shallow depth of 9 km. The epicentre was 79 km southeast of Palu, the USGS said, in an area northwest of the town of Poso.